ah, the holidays. we had so much fun decorating the table for halloween, that we had to do it for christmas too! 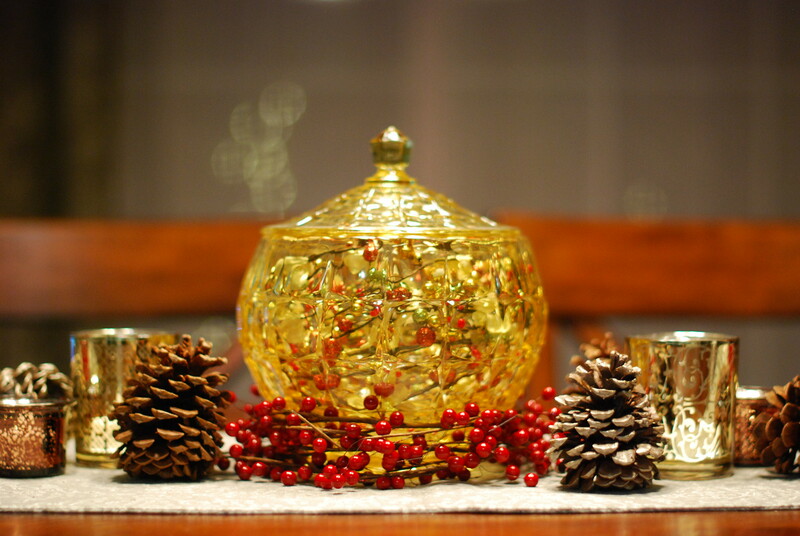 we kept the pretty antique bowl and added pinecones, berry garlands, and decorative candle holders from michaels . oh, and the pretty silver damaske table runner is from sur la table. outside, we only put some string lights up on the two small trees in the front yard. it's not much, but we didn't want to put too much effort into the exterior decorations just yet this year. 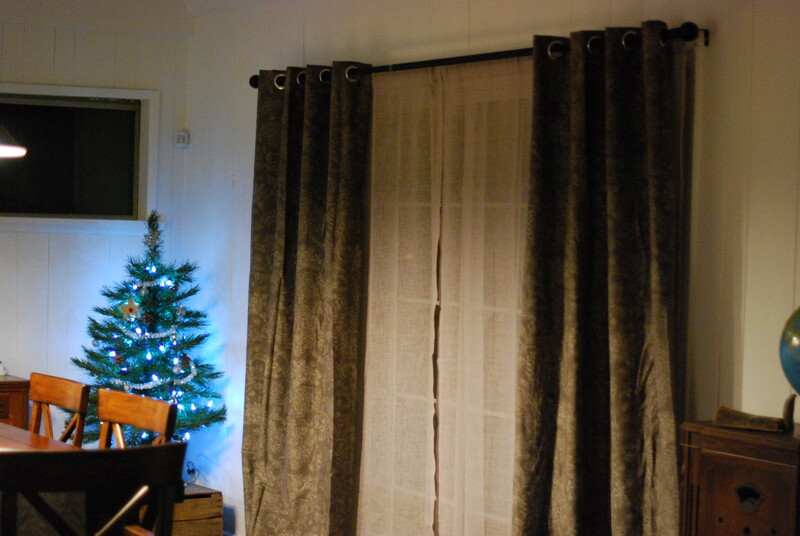 we also put up a small christmas tree in the corner of the dining room (all the same decorations as last year) and - wait for it -purchased curtains!!!!!!!!!!! 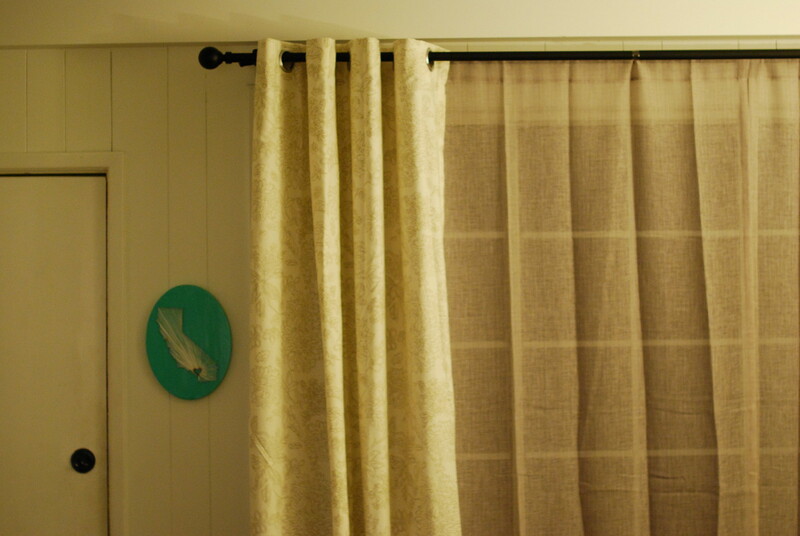 the curtain rods were from overstock, and the curtains themselves were from target (the sheer are nate berkus heathered herringbone in gray, and the decorative are threshold grayson toile floral in shell and chocolate). and yea, i was too lazy to iron them first, but i figure they'll de-wrinkle on their own over time. what i really love about them though, is how much warmer and cozier they make the house. without them, and all our white walls, things felt really sharp and cold. and yea, we've cleared out so much of the erroneous stuff too - the bookshelf is long gone, and other than the wine fridge along that back wall, all of that has been removed and replaced with much nicer things (but that's for another post). it's really starting to feel like a home, guys! 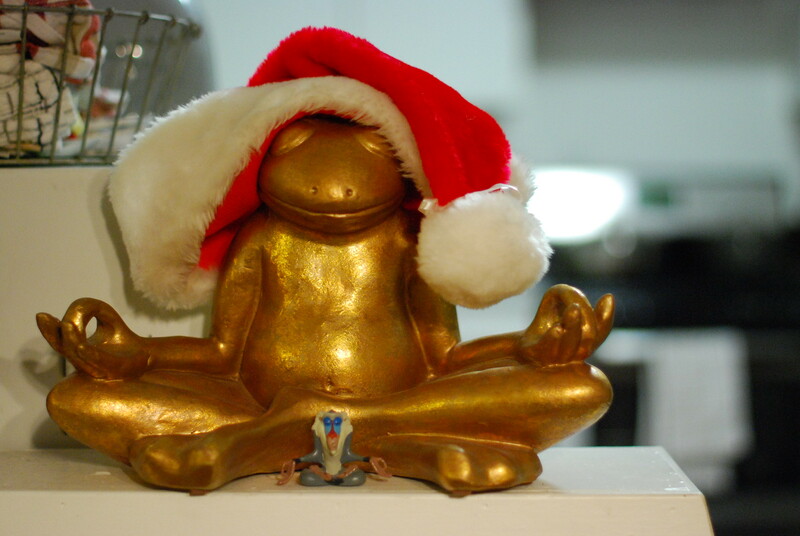 also, gold frog and rafiki wish you peace and serenity this christmas! we bought personalized velvet stockings (don't you just love the little elf sock one for sanford?! ), and needed some way of putting them on the mantle place. so with a piece of spare firewood, some hooks and spray paint, we made our own! though, there is certainly still some work to do on them - anything heavier than the stocking itself would yank them right off at the moment. james was super stoked to be able to finally use the miter saw we bought over the summer. it had been purchased with plans to build a fancy planter box, but unforeseen circumstances put those plans on hold. after drilling pilot holes into the little cut logs, we screwed in some screw hooks we'd picked up. before spray painting, i taped around the screw-in point and then wrapped with more paper and tape, just to be safe! 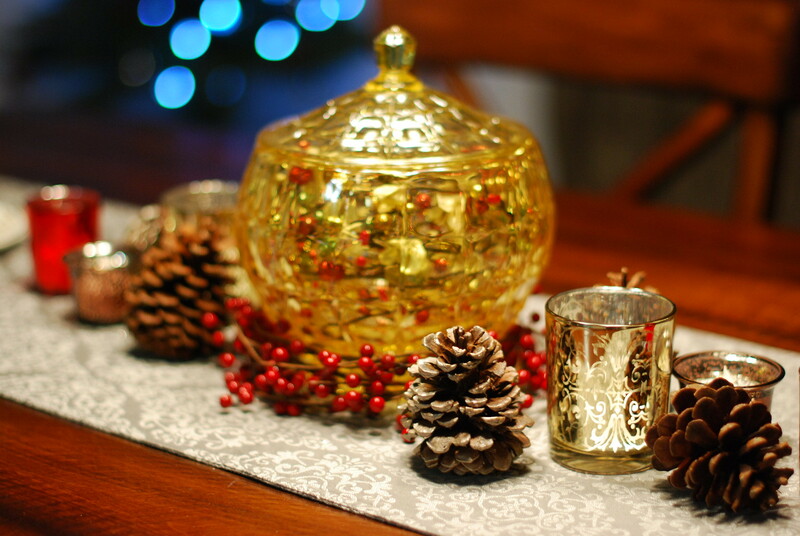 the rust-oleum in champagne mist was so pretty that i also busted out about half the pinecones we'd bought to decorate with and gave them a gentle spritzing too! since we can't put anything in the stockings yet, we'll need to do some more work to them so that they can be weighted down from behind the holder itself. 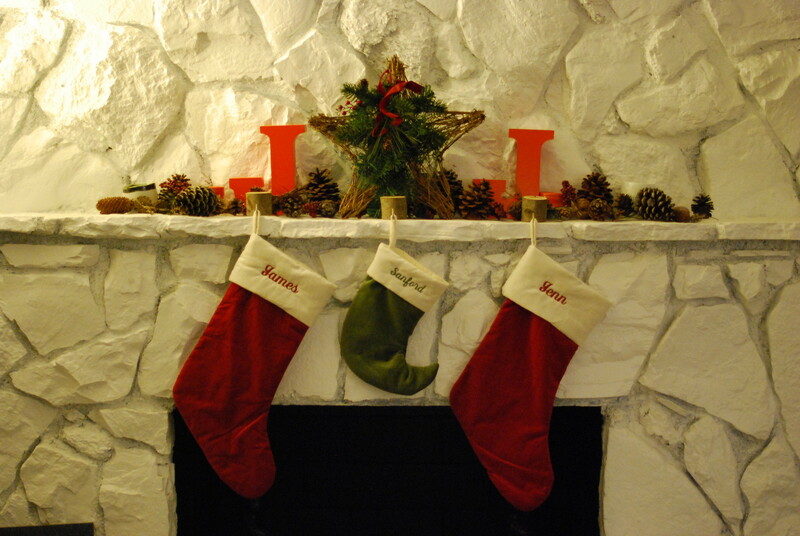 the star and garland-ing was from michaels, and the stockings were from pottery barn.